JOIN US for GroovyBeBop & Viva La Musica! BROOKLINE, BOSTON, CAMBRIDGE, & SOMERVILLE! At last! Music & Movement classes to celebrate the Summertime! Summer Jive classes are a great way to fit Music & Movement classes around your vacations! There are a plethora of options throughout the Summer to accommodate families' varied vacation schedules. 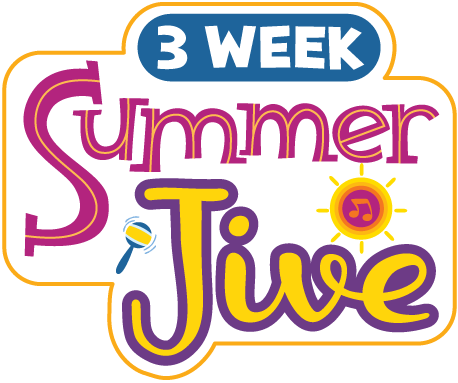 More laid-back than our normal offerings, you'll love Summer Jive whether you want to sing along in English or Spanish! Most importantly, you and your child will have FUN! SATURDAYS ( 4pm) July 14, July 21, July 28 at Inner Space, Brookline Village. WEDNESDAYS (10:30am) June 27, July 11, July 18 at Old South Church, Copley Square. MONDAYS (9am & 10am) August 6, August 13, August 20 at Hope Fellowship Church, Porter/Davis Square. THURSDAYS (9:30am, 10:30am, 11:30am) July 19, July 26, August 2 at Lesley University Porter Square. SUNDAYS (10am) July 1, July 15, July 22 (NO CLASS JULY 8) at Lily Pad in Inman Square. MONDAYS (9am, 10am, 11am) August 6, August 13, August 20 at Hope Fellowship Church, Davis/Porter Square. TUESDAYS (9am) July 3, July 10, July 17 at Shanti at the Armory Somerville, Highland Avenue. THURSDAYS (9am, 10am, 11am) July 12, July 19, July 26 at FIRST CHURCH SOMERVILLE, Davis/Powderhouse Square.